HARARE, Zimbabwe (CNN) -- Roy Bennett, the former Zimbabwean opposition activist who was arrested Friday shortly before he was due to become a Cabinet minister, has been charged with conspiracy to commit banditry, sabotage and terrorism, his lawyer told CNN. 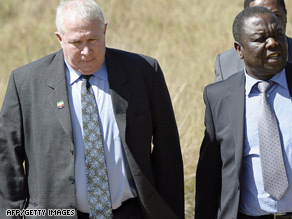 Roy Bennett, left, pictured with MDC leader Morgan Tzvangirai, is also the party's treasurer. The Movement for Democratic Change nominated Bennett to be deputy minister of agriculture in a national unity government with President Robert Mugabe's ZANU-PF party, which has ruled the country since independence in 1980. Bennett was arrested on Friday while on his way to South Africa, where he has been living for three years. Bennett, who is also the party's treasurer, was pulled from an aircraft at the airport in Zimbabwe's capital, Harare, the MDC said. Police accuse him of funding the acquisition of weapons to commit the crimes he is charged with. Bennett will appear in the Mutare magistrate's court on Monday, his lawyer Trust Maanda told CNN. Bennett, a white coffee grower, is an old foe of Mugabe's government. His farms were seized during the country's controversial land reform program. He has previously being jailed for assaulting Justice Minister Patrick Chinamasa in parliament. Hundreds of party members and supporters Friday surrounded the Mutare police station where Bennett was being held, the party said. The incident happened the same day that other MDC ministers in the new unity government took their oaths of office. The swearing-in eventually took place but was delayed, the MDC said, because Mugabe and his ZANU-PF party wanted to appoint more ministers than they were allowed in the new government. Under the power-sharing deal signed in September, the ruling ZANU-PF party gets 17 cabinet posts and the MDC gets 13. Mugabe brought a "bloated" list of 22 Cabinet ministers to the swearing-in ceremony, but the MDC leadership insisted Mugabe stick to the 17 agreed Cabinet posts. The stalemate lasted for more than an hour, until Mugabe's party agreed that only 17 of their proposed ministers take office. CNN's Nkepile Mabuse contributed to this report.